Topsham SAGE Direction Center DC-05 (1958-1969) - A Cold War SAGE System Direction Center first established in 1958 on Topsham Air Force Station, Topsham, Sagadahoc County, Maine. Named Topsham SAGE Direction Center after the location. Assigned a Sage ID of DC-05. Deactivated as a SAGE Direction Center in 1969. Topsham Air Force Station. The SAGE Direction Center is on the Left, the Housing Area is on the Right. Established in 1958 and became operational on 1 Mar 1958 as Topsham SAGE Direction Center DC-05. In 1957, four Nike Ajax missile sites were placed around Loring Air Force Base for protection of the USAF Strategic Air Command B-52 bombers and their nuclear weapons. Army NIKE Headquarters facilities were located at Loring Air Force Base along with a NIKE manual AADCP command post. 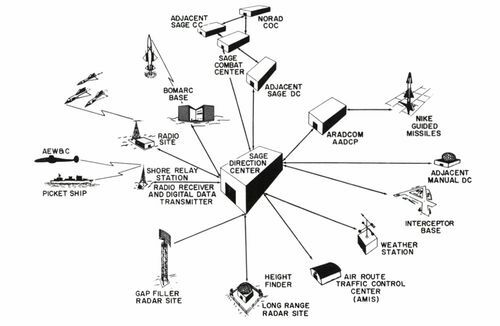 Caswell Air Force Station provided long-range search and height-finder radar data to the AADCP where it was plotted manually on a plotting board with tracks allocated to the individual NIKE batteries. With the SAGE System implementation, the manual plotting and assignment of tracks to the individual NIKE Batteries was eliminated and the functions were taken over by the AADCP SAGE System console operators at the Topsham SAGE Direction Center DC-05. In 1958-1959, NIKE sites L-13 and L-58 were converted from the conventionally armed Ajax to nuclear-armed Hercules missiles. These sites remained operational until 1966. NIKE sites L-31 and L-85 were not selected for upgrade and site L31 was closed. The remaining NIKE sites were closed in June 1966. Topsham SAGE Direction Center DC-05 closed on 30 Sep 1969. Location: On former Topsham Air Force Station, Topsham, Sagadahoc County, Maine. Winkler, David F., Searching the Skies: the Legacy of the United States Cold War Defense Radar Program, USAF Hq Air Combat Command, 1997, 192 pages, Pdf. This page was last modified 20:18, 7 January 2019 by John Stanton.